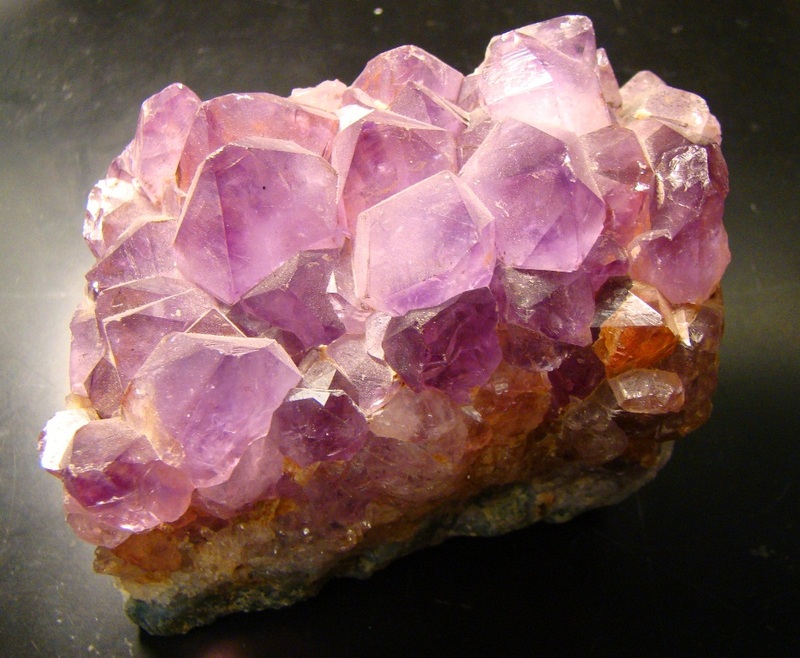 Rocks are composed of a relatively small number of minerals, the rock-forming minerals. Eight minerals make up the vast majority of igneous rocks. The eight include the two feldspars plagioclase and orthoclase (potassium feldspar), quartz, the micas muscovite and biotite, the amphibole mineral hornblende, the pyroxene mineral augite, and the green mineral olivine. 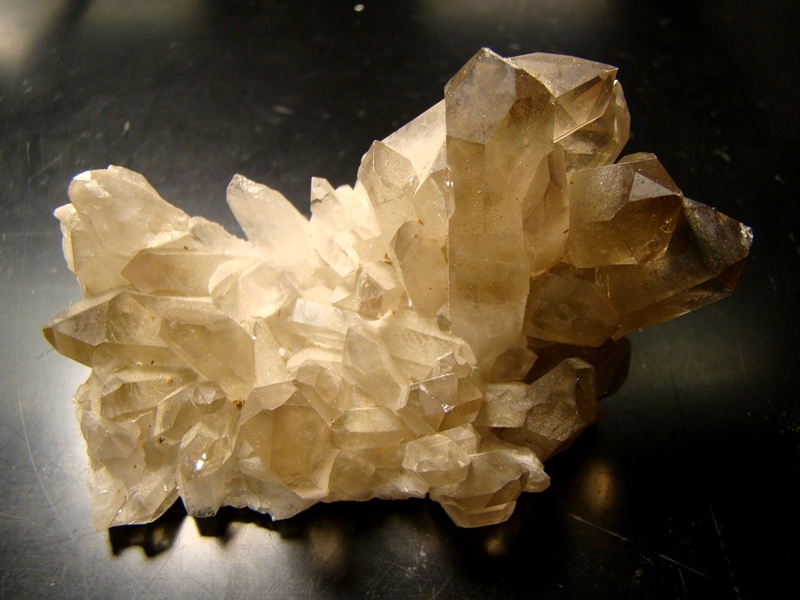 Sedimentary rocks most often are composed of clay, quartz and calcite, but may include dolomite, gypsum and halite (rock salt). 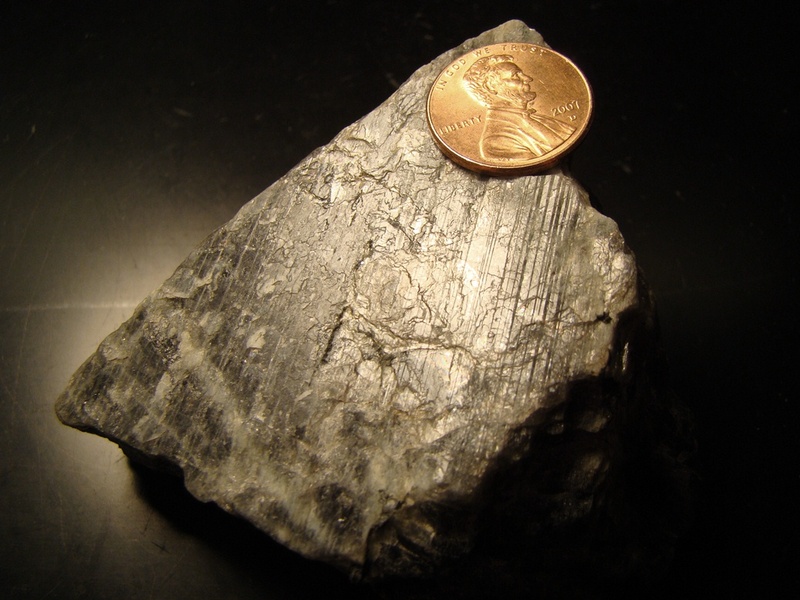 Metamorphic rocks are chemically complex; they often include the igneous minerals listed above as well as chlorite, epidote, actinolite, garnet, serpentine, and many others. The feldspars are the most common mineral family in the crust of the Earth (about half of all minerals). 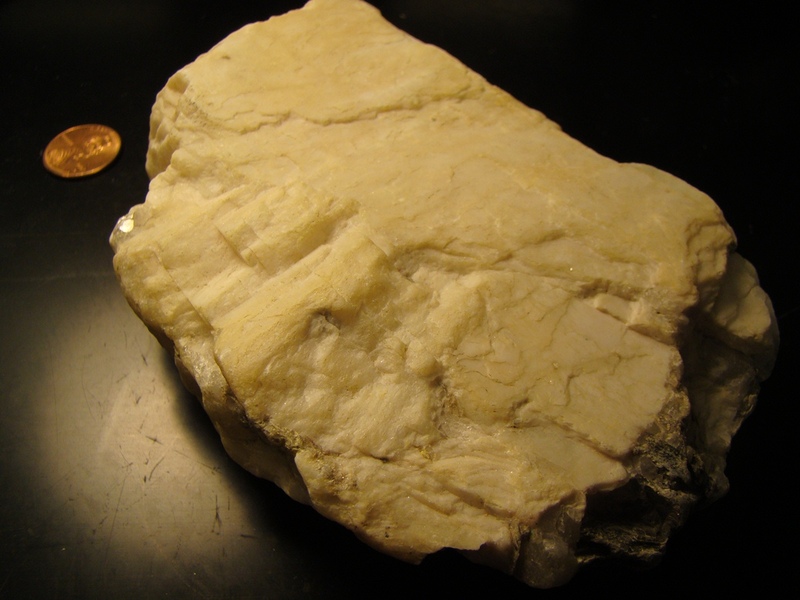 This is a sample of potassium feldspar (orthoclase). 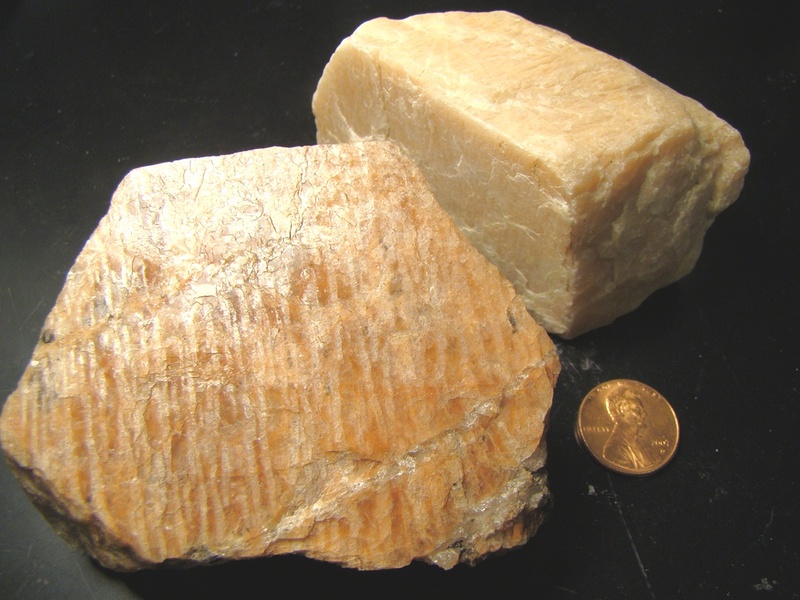 Potassium feldspar (orthoclase) is often pinkish in color and displays the property of cleavage, the tendency to break along flat planes. It is harder than glass. 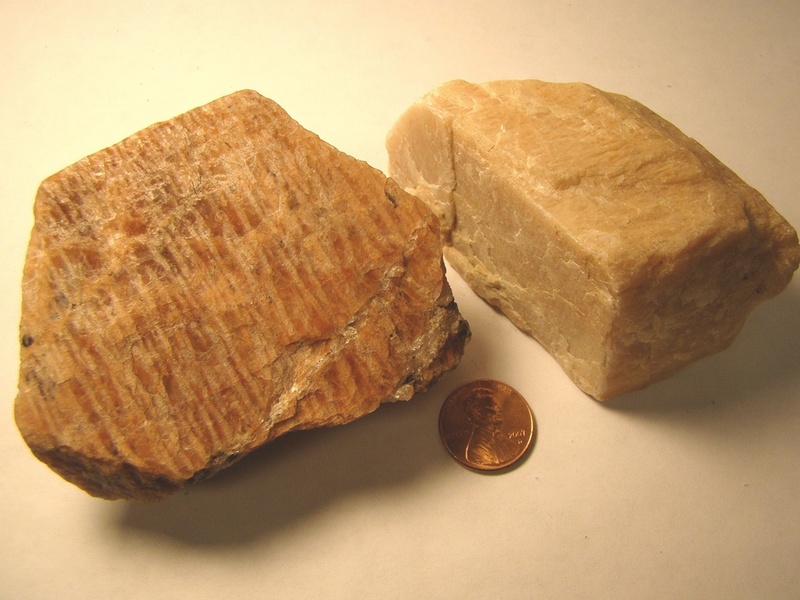 While cooling, two related forms of feldspar essentially try to grow in the same space and intermingle. 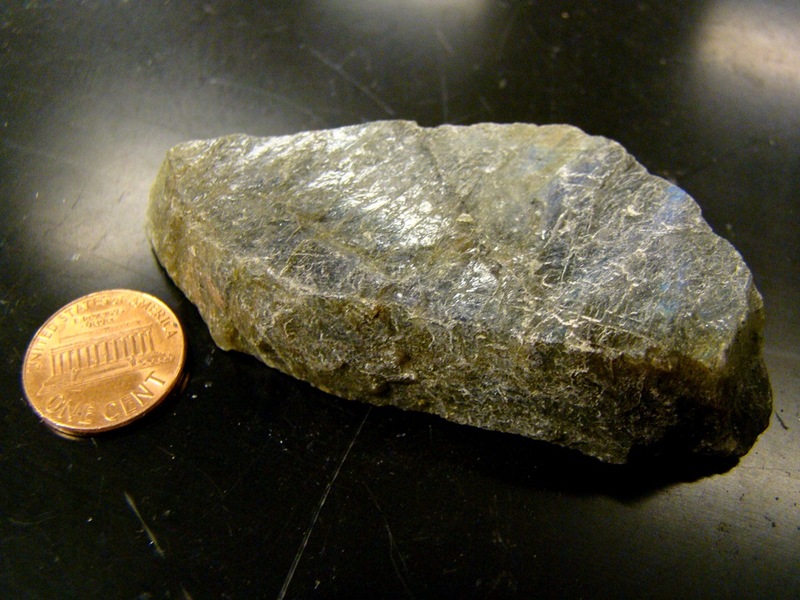 The resulting irregular layers are called perthite intergrowths. 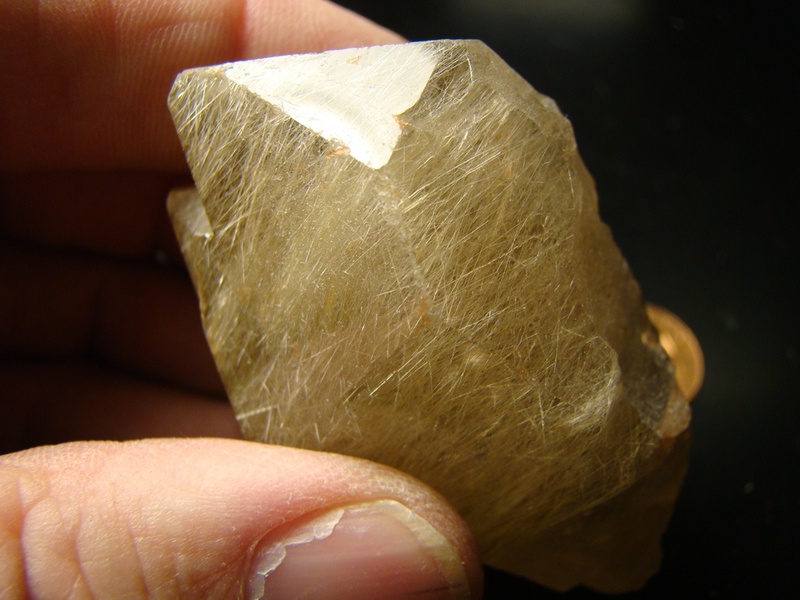 Potassium feldspar (orthoclase). Perthite intergrowths on the left sample. 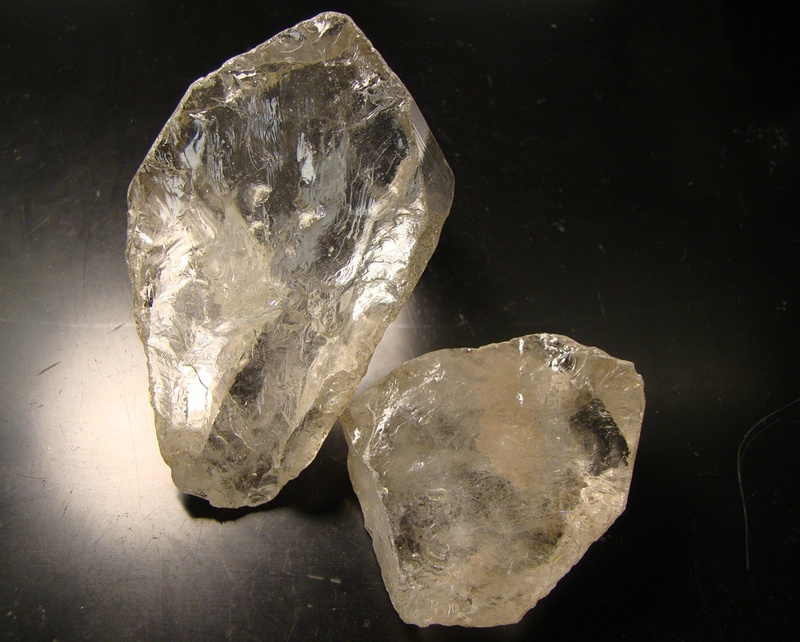 The mineral has two directions of cleavage that meet at right angles. 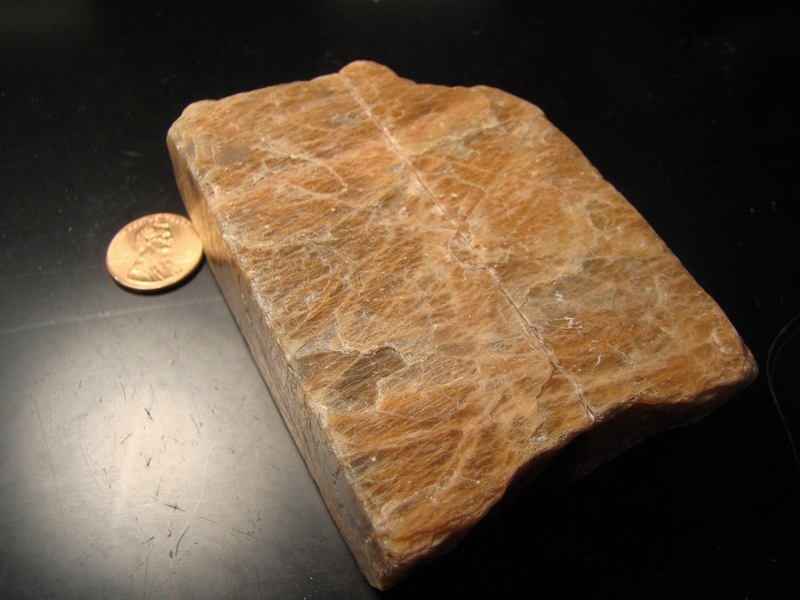 Plagioclase is the other important form of feldspar. It is chemically complex, with a sodium- and calcium-rich varieties. Plagioclase is harder than glass. 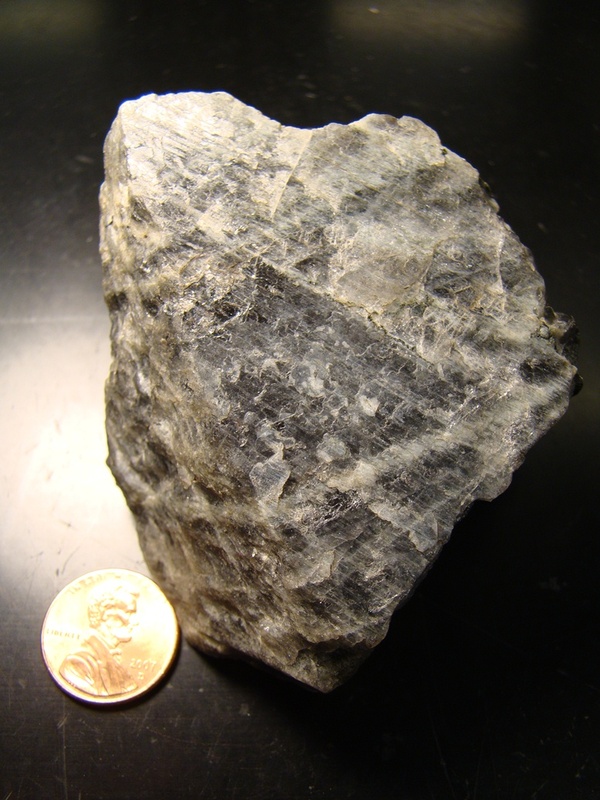 Plagioclase can be white or gray in color, and has two directions of cleavage at close to right angles. 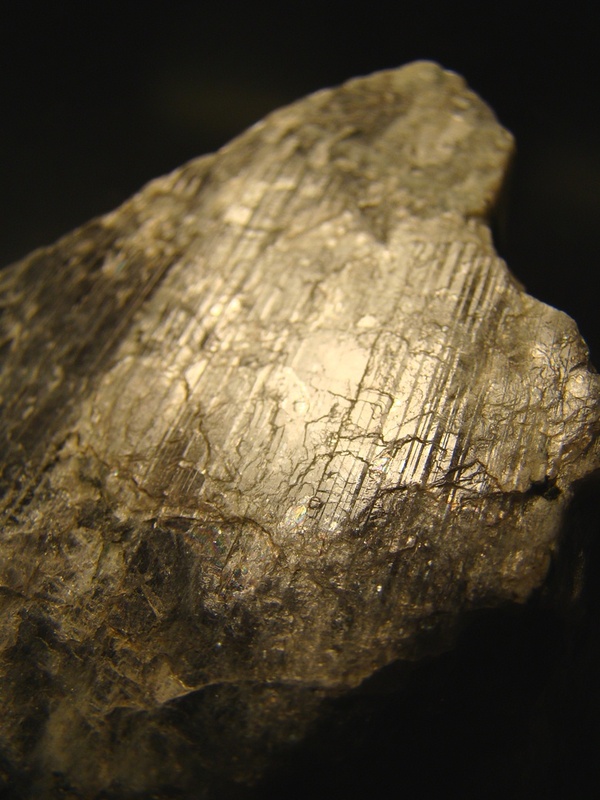 Plagioclase has a unique pattern of crystallization called twinning that leads to a property of parallel lines called striations. 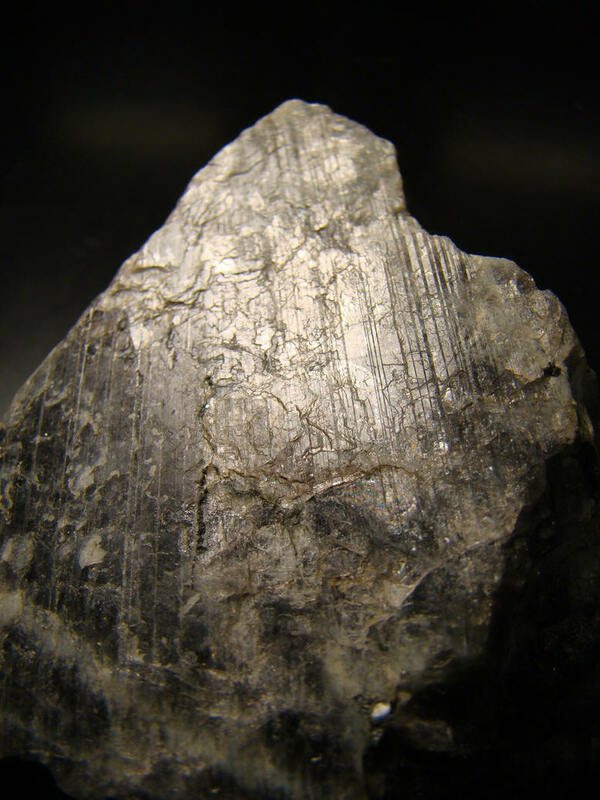 Striations on plagioclase look like record grooves, and can be seen in very small crystals. It is a diagnostic property of plagioclase Plagioclase with striations. 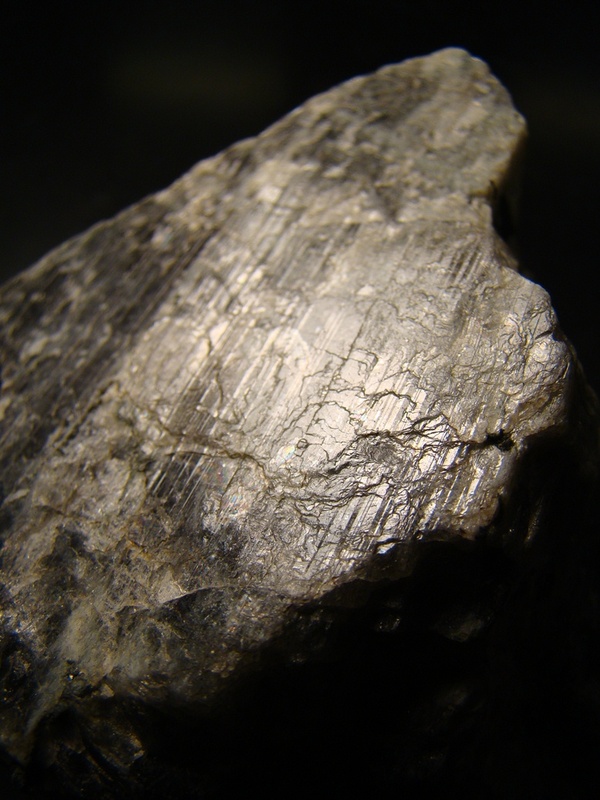 Plagioclase with striations. 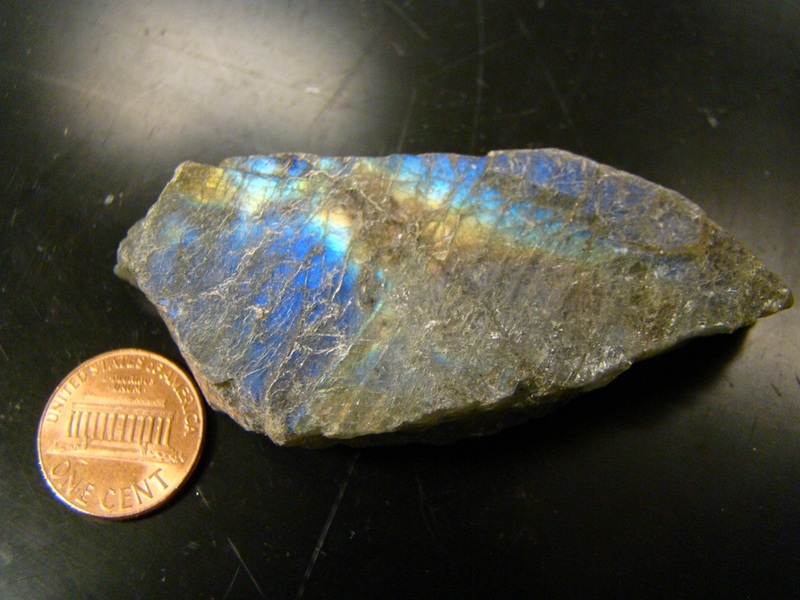 One form of plagioclase, called labradorite, is gray in color but displays an interesting property called "labradorescence" (see next photo). "Labradorescence" is an intense play of color from some angles. "Black Granite" used in countertops is not granite, but is a rock called gabbro that contains lots of plagioclase. Rose quartz displays conchoidal fracture, the glasslike rounded smooth surfaces. 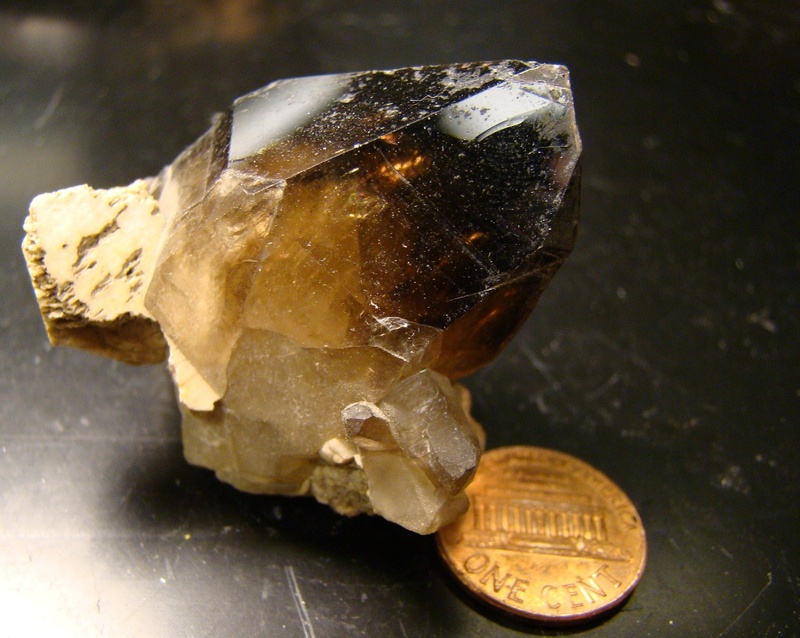 Smoky quartz forms when clear crystals are irradiated. Samples can be artificially produced through the use of x-rays. 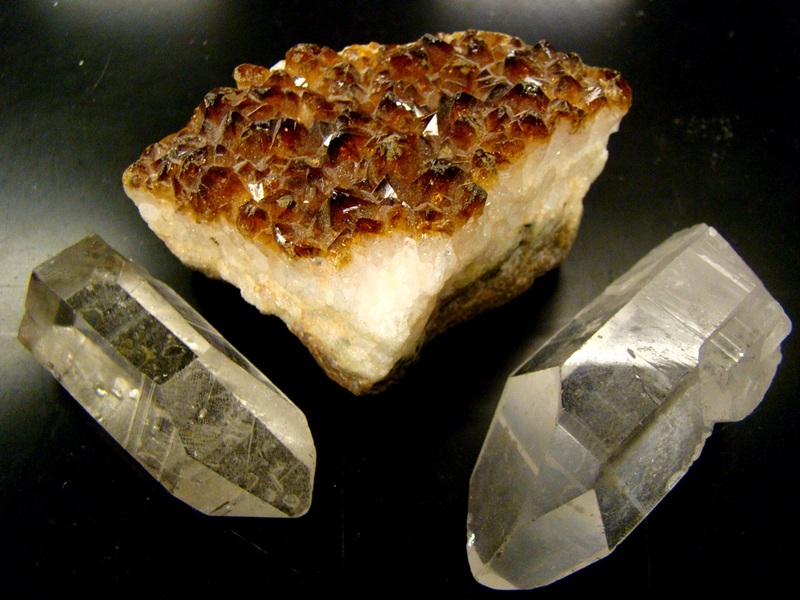 Smoky quartz crystals Rutilated quartz, a quartz crystal containing long fibrous crystals of rutile, a titanium oxide. 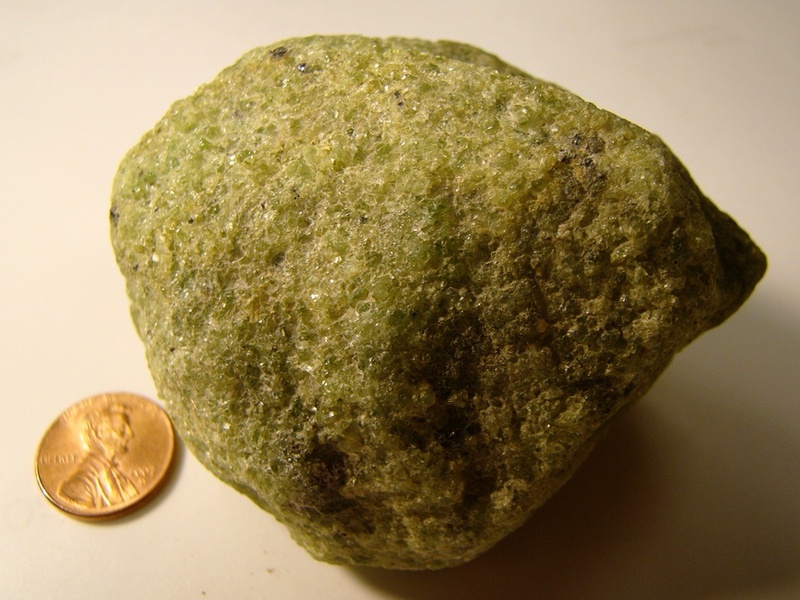 Another important rock-forming mineral is olivine, seen here as a chunk of dunite, a rock composed almost entirely of olivine Olivine crystals in a xenolith within basalt. These chunks of rock within the basalt are pieces of the earth's mantle, the layer underlying the crust. 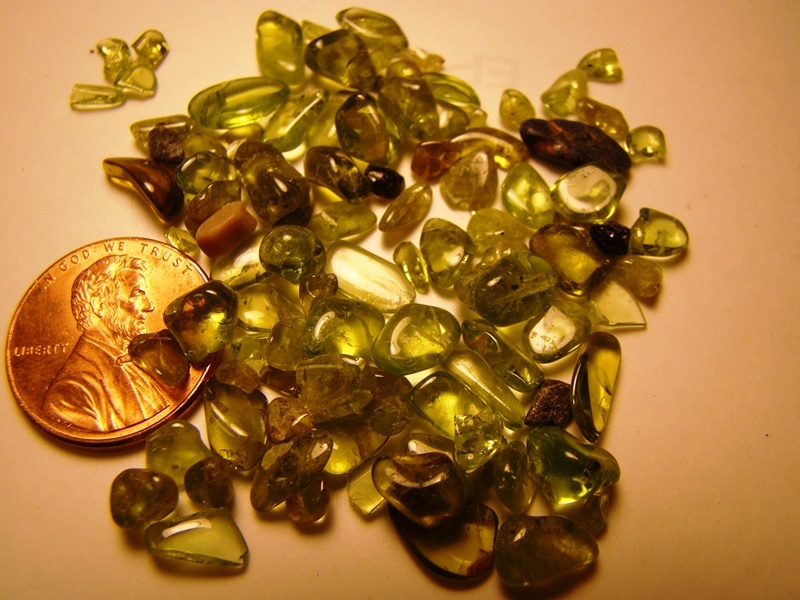 Olivine is also known as the semi-precious gemstone peridot. It can be faceted or polished, as above. 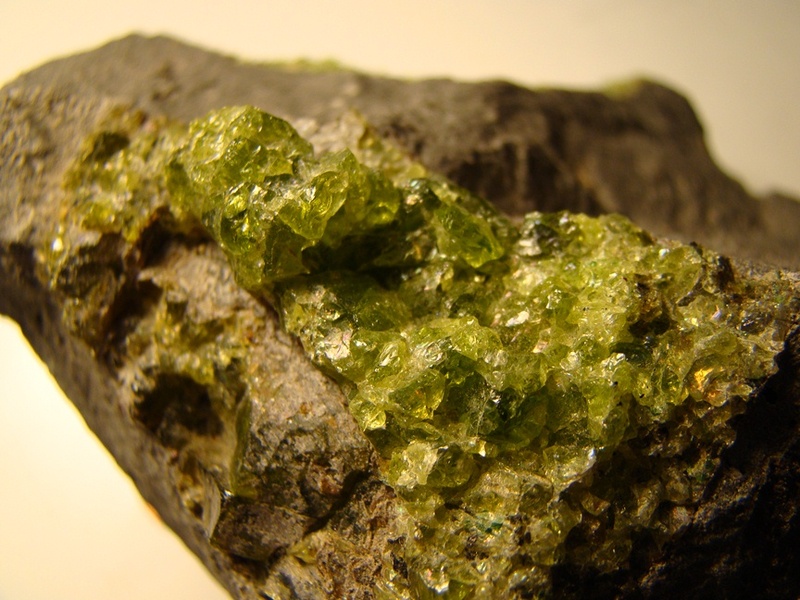 Although the minerals shown below are generally rare, they are important to society as a source of metals and other industrial materials, and as gemstones. 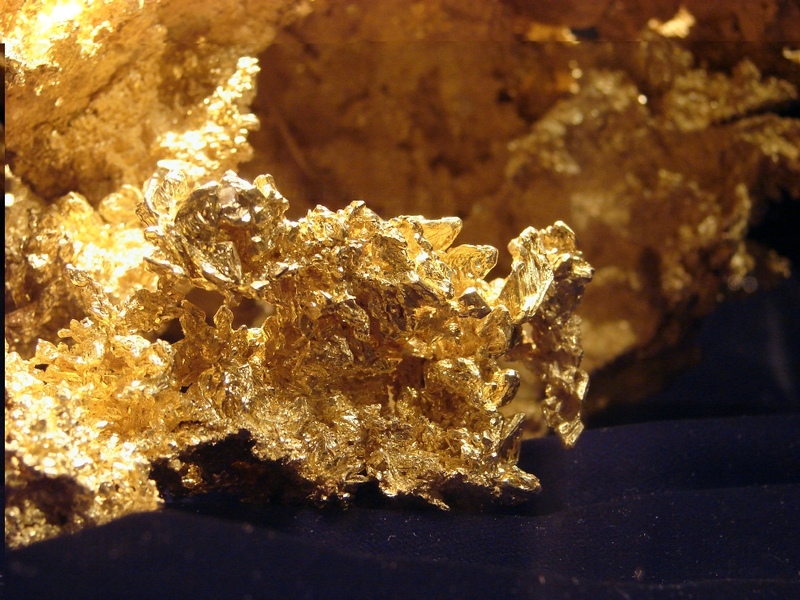 The gold nugget at the Ironstone Winery in California's Mother Lode. 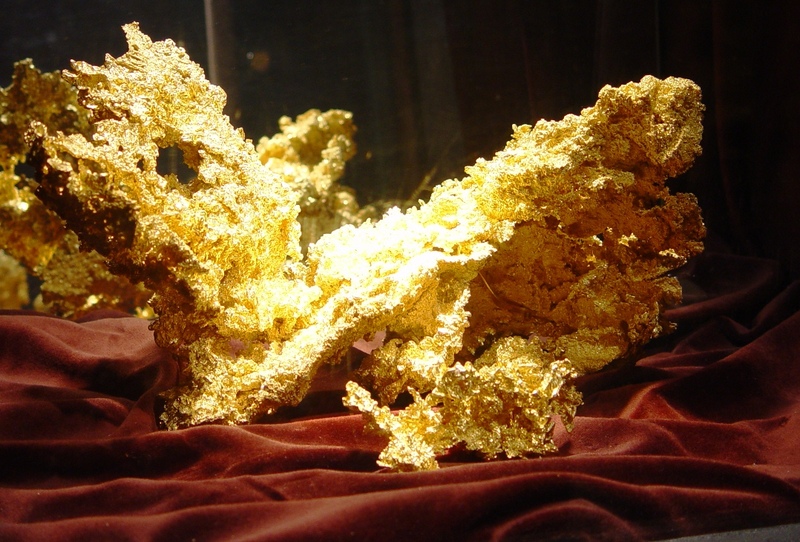 The nugget was found in 1992 at the Sonora Mine and weighs 44 lbs. 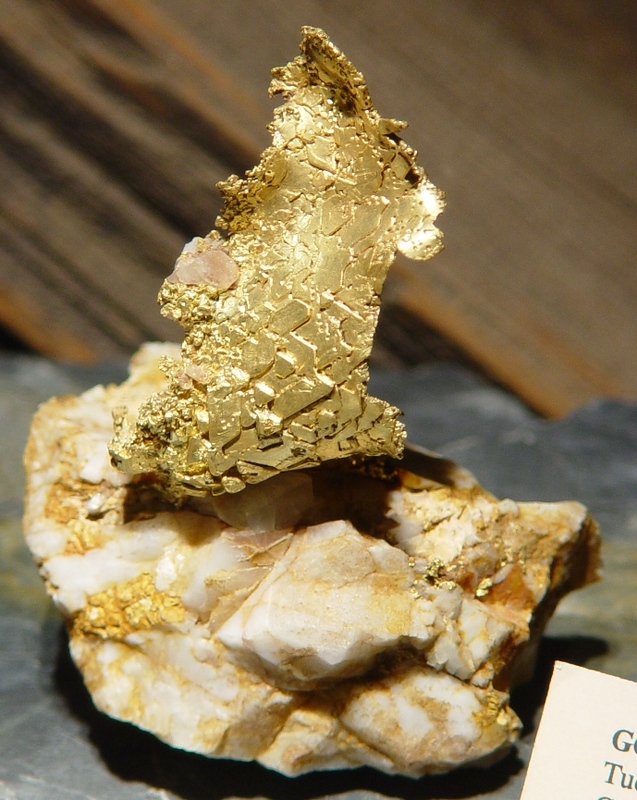 A gold nugget at the California State Mineral Museum in Mariposa, California. 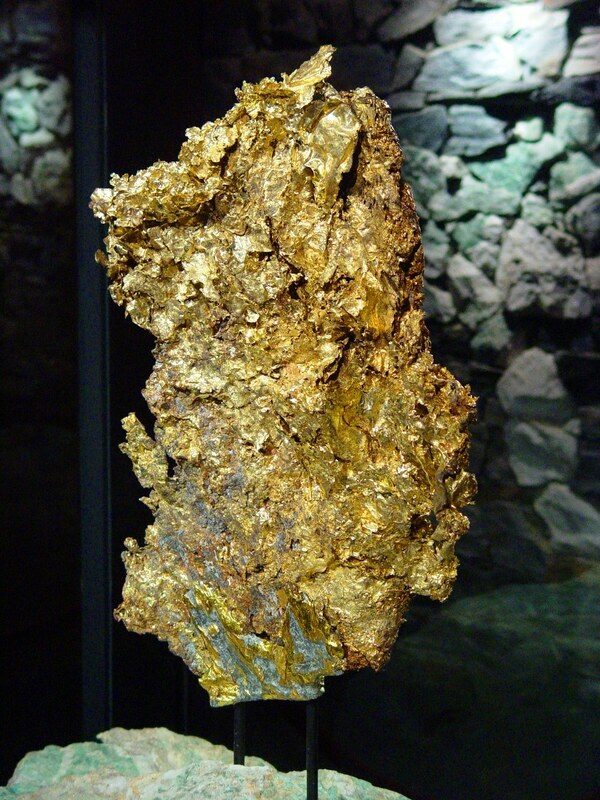 The Fricot Nugget, on display at the California State Mineral Museum in Mariposa, California. The nugget weighs nearly 14 lbs. Detail of the Fricot Nugget, on display at the California State Mineral Museum in Mariposa, California. The nugget weighs nearly 14 lbs.